Each day in my studio, I smile and feel lucky that I have such a fun job. The processes involved in my jewelry can be divided into metal fabrication, enamelling, and glass bead making. All are very different, which I am thankful for. Bouncing around from technique to technique keeps me me on my toes and adds variety to my day. There is no room for boredom in the Eye Candy Studio. Most of my design work begins with an idea, metal sheet, and wire. I come up with a concept, create a simple drawing...and cut out the parts in metal. The metal is cut with a fine blade threaded into a jewelers saw. This is the most used tool in my studio, I couldn't create without it! The metal parts are then connected by heating the elements up and soldering them together, or using "cold" connections like rivets. The metal edges are filed to smooth the rough spots. Patinas are often added toward the end to give the metal an antiqued or darkened appearance in certain areas. Other areas are polished to impart a shiny finish. Pictures of this process are in the works. Check back soon! 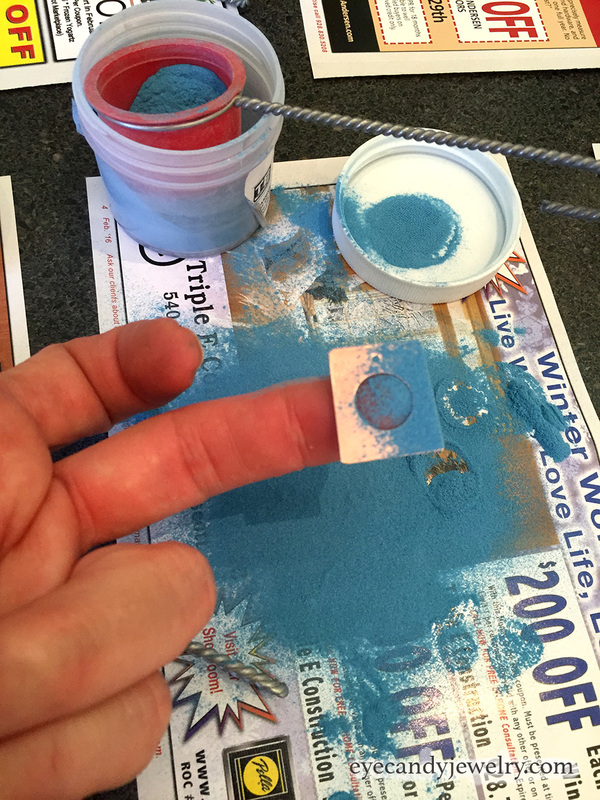 Enamelling is a really fun process that allows me to get COLOR COLOR COLOR into my designs. I fire the pieces with a torch or in a kiln to 1500 degrees, and VOILA, the enamel melts onto the copper and forms a hard, durable color coating. This is how my puzzle earrings look after they have been enamelled and assembled with sterling silver components. Cute, huh? Colorful and fun, definitely! 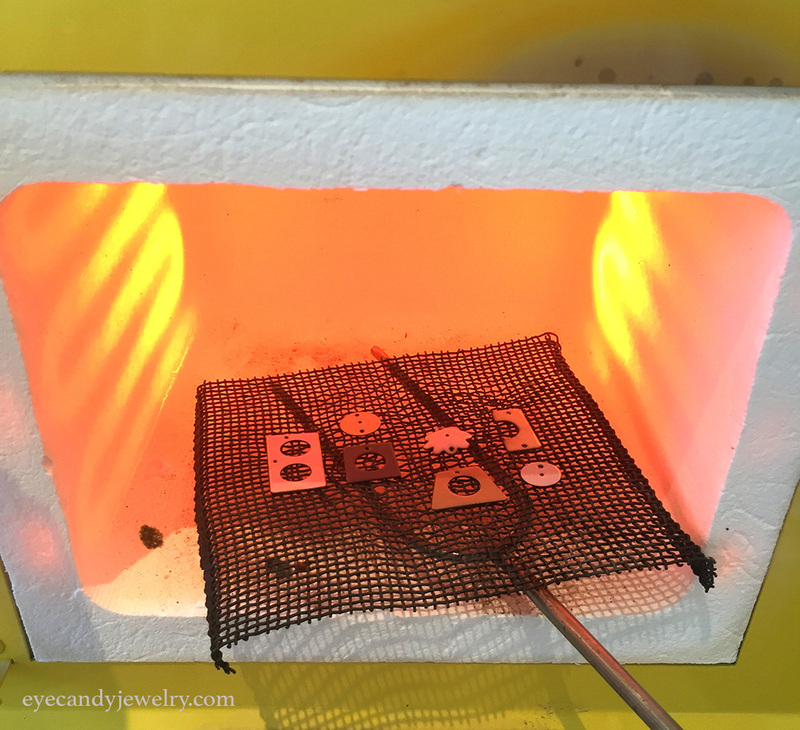 Enameling is definitely a signature technique used in Eye Candy Jewelry. I just can't get enough of it as it makes my jewelry look cheery and happy. Many years ago I went to a show and bought glass beads to use in my jewelry. I loved the juicy colors and how they lit up when you wear them. My friend Jim Antonius was an established bead maker and offered to teach me how to make my own beads in exchange for a piece of my jewelry for his wife. DEAL! Since then, handmade Eye Candy glass beads have made colorful appearances in many of my designs. Sometimes the beads are the focal point of the piece, like in my Gumdrop and Lifesaver designs. In other cases, Eye Candy beads might be used as little embellishments in my big fancy pendants, like the Wild Bill necklace on the front page of the website..
Glass beads are made by melting the tip of a glass rod, called a "cane," in the flame of a torch. As the glass melts, it turns to the consistency of honey. The molten glass is wound around a thin metal rod called a "mandrel" where it is shaped and formed with tools to attain the desired shape. Upon completion, the bead is annealed in a kiln at 970 degrees to stabilize its molecular activity and slowly cool to room temperature. Each bead is removed from the mandrel and combined with sterling silver to make Eye Candy Jewelry. Often, I have help and encouragement from my cat, Ollie. Although he likes to be in the way more than he actually helps.